During an impromptu Christmastime road trip last year to Puerto Nuevo, Mexico, Kali Wilgus and Liz "LC" Connelly lost their minds over tortillas. "In Puerto Nuevo, you can eat $5 lobster on the beach, which they give you with this bucket of tortillas," Connelly says. 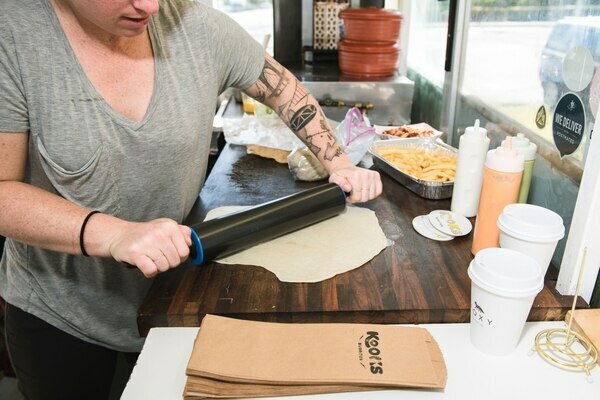 "They are handmade flour tortillas that are stretchy and a little buttery, and best of all, unlimited." Connelly and Wilgus were so enamored with the tortillas, they tried to uncover the recipe. "I picked the brains of every tortilla lady there in the worst broken Spanish ever, and they showed me a little of what they did," Connelly says. "They told us the basic ingredients, and we saw them moving and stretching the dough similar to how pizza makers do before rolling it out with rolling pins. They wouldn't tell us too much about technique, but we were peeking into the windows of every kitchen, totally fascinated by how easy they made it look. We learned quickly it isn't quite that easy." 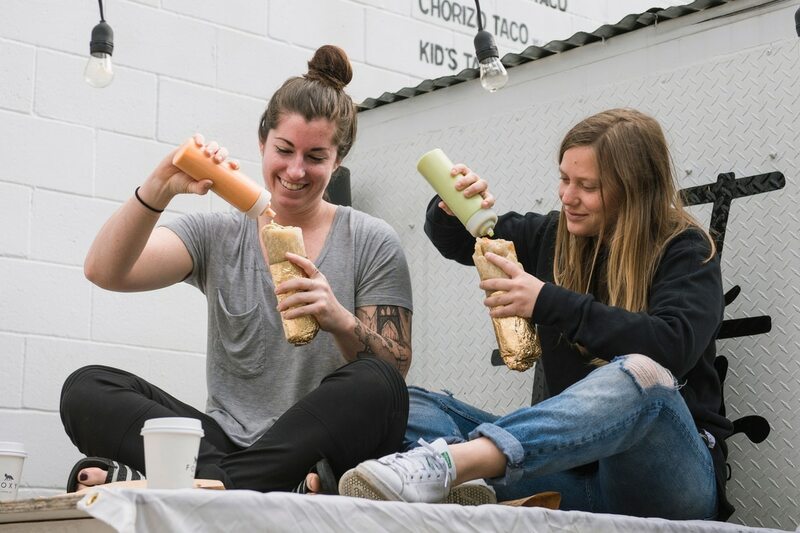 Connelly and Wilgus have turned their passion into new weekend spot Kooks Burritos, which has a concept that fits twee Portland: a breakfast burrito pop-up inside the hip Tight Tacos food cart in a Southeast Portland parking lot. 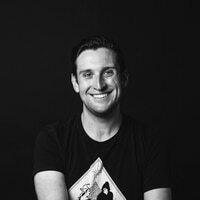 "On the drive back up to Oregon, we were still completely drooling over how good [the tortillas] were, and we decided we had to have something similar in Portland," Connelly says. "The day after we returned, I hit the Mexican market and bought ingredients and started testing it out. Every day I started making tortillas before and after work, trying to figure out the process, timing, refrigeration and how all of that works." Well, she figured it out. 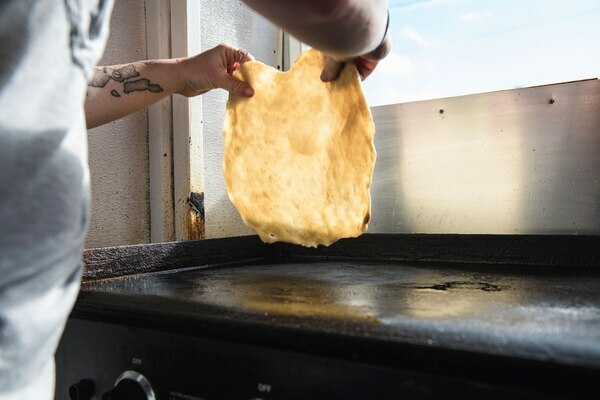 Connelly rolls out the tortillas in front of you and cooks them on the cart's flat-top griddle, bubbles forming through the uneven circle as the gentle smell of frying dough wafts from the cart. 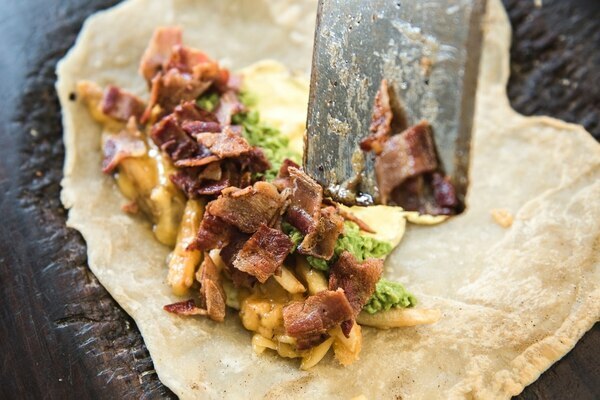 That tortilla is stretchy, pie-crust flaky, char-kissed and stuffed with fixins authentic only to SoCal burrito joints: french fries, scrambled eggs, guacamole, cheese and your choice of bacon or carne asada. The result is as decadent as it sounds, the flake of the tortilla and soft crunch from the fries contrasting with the gooey goodness of the eggs, cheese and guac in a hangover-killing burrito. Served with Wilgus' neon-green serrano salsa and neon-orange chile de árbol salsa, both spicy and bright, breakfast doubles as a 'grammable burrainbow. "The second we had the tortilla, we were like, 'We're doing this,'" Connelly says. Get up a little early this weekend, and you can do it, too. Update: Kooks Burritos has closed.